The NCR QL710 is your ideal low cost point-of-sale solution. Designed to address the unique requirements for the hospitality industry, this essential terminal is an unquestionable price and performance leader. 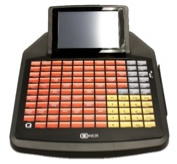 With a combined hybrid touchscreen and membrane keypad in a single unit, the QL710 provides robust, practical functionality. We have priced this unit at the lower end of the market to help you upgrade all those existing sites and sell in to the new ones.